John Archibald Wheeler (July 9, 1911 – April 13, 2008) was an American theoretical physicist. He was largely responsible for reviving interest in general relativity in the United States after World War II. Wheeler also worked with Niels Bohr in explaining the basic principles behind nuclear fission. Together with Gregory Breit, Wheeler developed the concept of Breit–Wheeler process. He is best known for linking the term "black hole" to objects with gravitational collapse already predicted early in the 20th century, for coining the terms "quantum foam", "neutron moderator", "wormhole" and "it from bit", and for hypothesizing the "one-electron universe". Soon after the Japanese bombing of Pearl Harbor brought the United States into World War II, Wheeler accepted a request from Arthur Compton to join the Manhattan Project's Metallurgical Laboratory in Chicago. He moved there in January 1942, joining Eugene Wigner's group, which was studying nuclear reactor design. He co-wrote a paper with Robert F. Christy on "Chain Reaction of Pure Fissionable Materials in Solution", which was important in the plutonium purification process. It would not be declassified until December 1955. He gave the neutron moderator its name, replacing the term "slower downer" used by Enrico Fermi. In 1951 Wheeler obtained permission from Bradbury to set up a branch office of the Los Alamos laboratory at Princeton, known as Project Matterhorn, which had two parts. Matterhorn S (for stellarator, another name coined by Wheeler), under Lyman Spitzer, investigated nuclear fusion as a power source. 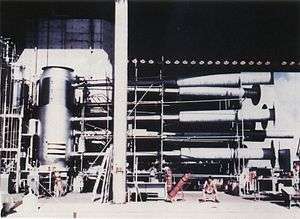 Matterhorn B (for bomb), under Wheeler, engaged in nuclear weapons research. Senior scientists remained disinterested and aloof from the project, so he staffed it with young graduate and post-doctoral students. In January 1953 he was involved in a security breach when he lost a highly classified paper on lithium-6 and the hydrogen bomb design during an overnight train trip. This resulted in Wheeler being given an official reprimand. Matterhorn B's efforts were crowned by the success of the Ivy Mike nuclear test at Enewetak Atoll in the Pacific, on November 1, 1953, which Wheeler witnessed. The yield of the Ivy Mike "Sausage" device was reckoned at 10.4 megatons of TNT (44 PJ), about 30 percent higher than Matterhorn B had estimated. Matterhorn B was discontinued, but Matterhorn S endures as the Princeton Plasma Physics Laboratory. For 72 years, Wheeler was married to Janette Hegner, a teacher and social worker. They became engaged on their third date, but agreed to defer marriage until after he returned from Europe. They were married on June 10, 1935, five days after his return. They had three children: Letitia, James English and Alison Wheeler. Jobs were hard to come by during the Great Depression, but Arthur Ruark offered him a position as an assistant professor at the University of North Carolina at Chapel Hill, at an annual salary of $2,300, which was less than the $2,400 Janette was offered to teach at the Rye Country Day School. In their later years, she accompanied him on sabbaticals to places such as France, Los Alamos, New Mexico, the Netherlands, and Japan. Wheeler and Hegner were founding members of the Unitarian Church of Princeton, and she initiated the Friends of the Princeton Public Library. Hegner died in October 2007  at the age of 99. After concluding his Matterhorn Project work, Wheeler resumed his academic career. In a 1955 paper he theoretically investigated the geon, an electromagnetic or gravitational wave that is held together in a confined region by the attraction of its own field. He coined the name as a contraction of "gravitational electromagnetic entity." He found that the smallest geon was a toroid the size of the Sun, but millions of times heavier. While working on mathematical extensions to Einstein's Theory of General Relativity in 1957, Wheeler introduced the concept and word wormhole to describe hypothetical "tunnels" in space-time. Bohr asked if they are stable and further research by Wheeler determined that they are not. During the 1950s Wheeler formulated geometrodynamics, a program of physical and ontological reduction of every physical phenomenon, such as gravitation and electromagnetism, to the geometrical properties of a curved space-time. Wormholes were just one manifestation of what Wheeler envisaged as the fabric of the universe, a chaotic sub-atomic realm of quantum fluctuations, which he called "quantum foam". For a few decades, general relativity had not been considered a very respectable field of physics, being detached from experiment. Wheeler was a key figure in the revival of the subject, leading the school at Princeton, while Dennis William Sciama and Yakov Borisovich Zel'dovich developed the subject at Cambridge University and the University of Moscow. The work of Wheeler and his students made high contributions to the Golden Age of General Relativity. His work in general relativity included the theory of gravitational collapse. 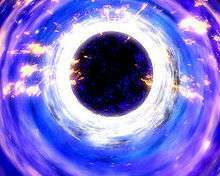 He used the term black hole in 1967 during a talk he gave at the NASA Goddard Institute of Space Studies (GISS). He was also a pioneer in the field of quantum gravity due to his development, with Bryce DeWitt, of the Wheeler–DeWitt equation, which is the equation governing the "wave function of the Universe". Alluding to Wheeler's "mass without mass", the festschrift honoring his 60th birthday was titled Magic Without Magic: John Archibald Wheeler: A Collection of Essays in Honor of his Sixtieth Birthday (1972). His writing style could also attract parodies, including one by "John Archibald Wyler" that was affectionately published by a relativity journal. Wheeler wrote Geometrodynamics (1962), and teamed up with Edwin F. Taylor to write Spacetime Physics (1966) and Scouting Black Holes (1996). With Kent Harrison, Kip Thorne and Masami Wakano he wrote Gravitation Theory and Gravitational Collapse (1954). This led to the voluminous general relativity textbook Gravitation (1973), co-written with Misner and Thorne. Its timely appearance during the golden age of general relativity and its comprehensiveness made it an influential relativity textbook for a generation. Looking back on Wheeler's 10 years at Texas, many quantum information scientists now regard him, along with IBM's Rolf Landauer, as a grandfather of their field. That, however, was not because Wheeler produced seminal re-search papers on quantum information. He did not—with one major exception, his delayed-choice experiment. Rather, his role was to inspire by asking deep questions from a radical conservative viewpoint and, through his questions, to stimulate others’ research and discovery. Wheeler's delayed choice experiment is actually several thought experiments in quantum physics that he proposed, with the most prominent among them appearing in 1978 and 1984. These experiments are attempts to decide whether light somehow "senses" the experimental apparatus in the double-slit experiment it will travel through and adjusts its behavior to fit by assuming the appropriate determinate state for it, or whether light remains in an indeterminate state, neither wave nor particle, and responds to the "questions" asked of it by responding in either a wave-consistent manner or a particle-consistent manner depending on the experimental arrangements that ask these "questions". Over the years, Wheeler's graduate students included Katharine Way, Richard Feynman, David Hill, Bei-Lok Hu, Kip Thorne, Jacob Bekenstein, John R. Klauder, William Unruh, Robert M. Wald, Arthur Wightman, Charles Misner and Hugh Everett. Wheeler gave a high priority to teaching, and continued to teach freshman and sophomore physics, saying that the young minds were the most important. At Princeton he supervised 46 PhDs, more than any other professor in the Princeton physics department. In 1979 Wheeler spoke to the American Association for the Advancement of Science (AAAS), asking it to expel parapsychology, which had been admitted ten years earlier at the request of Margaret Mead. He called it a pseudoscience, saying he did not oppose earnest research into the questions, but he thought the "air of legitimacy" of being an AAAS-Affiliate should be reserved until convincing tests of at least a few so-called psi effects could be demonstrated. During his presentation Wheeler incorrectly stated that J. B. Rhine had committed fraud as a student, and was forced to retract that statement in a letter to the journal Science. His request was turned down and the Parapsychological Association remained a member of the AAAS. In 1990 Wheeler suggested that information is fundamental to the physics of the universe. According to this "it from bit" doctrine, all things physical are information-theoretic in origin. I continue to reflect, again and again, on your central thesis that expansion is the origin of all asymmetry in time. Over the years Wheeler gathered numerous prizes and awards, including the Enrico Fermi Award in 1968, the Franklin Medal in 1969, the National Medal of Science in 1971, the Einstein Prize in 1969, the Niels Bohr International Gold Medal in 1982, the Oersted Medal in 1983, the J. Robert Oppenheimer Memorial Prize in 1984 and the Wolf Foundation Prize in 1997. He was a member of the American Philosophical Society, the Royal Academy, the Accademia Nazionale dei Lincei, and the Century Association. He received honorary degrees from 18 different institutions and, in 2001, Princeton used a $3 million gift to establish the John Archibald Wheeler/Battelle Professorship in Physics. After his death, the University of Texas named the John A. Wheeler Lecture Hall in his honor. He was influential in mentoring a generation of physicists of the Golden Age of General Relativity, who made notable contributions to quantum mechanics and gravitation. Wheeler, John Archibald (2000). Exploring Black Holes: Introduction to General Relativity. Addison Wesley. ISBN 0-201-38423-X. ↑ Wheeler & Ford 1998, pp. 64, 71. ↑ Wheeler & Ford 1998, pp. 71–75. ↑ Wheeler & Ford 1998, pp. 78–80. ↑ Leonhart 1939, p. 287. 1 2 Wheeler & Ford 1998, p. 85. ↑ Wheeler & Ford 1998, p. 97. ↑ Wheeler & Ford 1998, pp. 105–107. ↑ Wheeler & Ford 1998, pp. 123–127. ↑ Breit, G.; Wheeler, John (December 1934). "Collision of Two Light Quanta". Physical Review. American Physical Society. 46 (12): 1087–1091. Bibcode:1934PhRv...46.1087B. doi:10.1103/PhysRev.46.1087. ↑ Wheeler & Ford 1998, pp. 151–152. 1 2 3 Ford, Kenneth W. (February 4, 1994). "Interview with Dr. John Wheeler – Session VI". American Institute of Physics. Archived from the original on February 2, 2013. 1 2 3 4 MacPherson, Kitta (April 14, 2008). "Leading physicist John Wheeler dies at age 96". News at Princeton. 1 2 Mehra & Rechenberg 1982, p. 990. ↑ Wheeler, John A. (December 1937). "On the Mathematical Description of Light Nuclei by the Method of Resonating Group Structure". Physical Review. American Physical Society. 52 (11): 1107–1122. Bibcode:1937PhRv...52.1107W. doi:10.1103/PhysRev.52.1107. ↑ Teller, E.; Wheeler, J. A. (May 1938). "On the Rotation of the Atomic Nucleus". Physical Review. American Physical Society. 53 (10): 778–789. Bibcode:1938PhRv...53..778T. doi:10.1103/PhysRev.53.778. ↑ Mehra & Rechenberg 1982, pp. 990–991. ↑ Way, Katharine (May 1939). "The Liquid-Drop Model and Nuclear Moments". Physical Review. American Physical Society. 55 (10): 963–965. Bibcode:1939PhRv...55..963W. doi:10.1103/PhysRev.55.963. ↑ Bohr, Niels; Wheeler, John Archibald (September 1939). "The Mechanism of Nuclear Fission". Phys. Rev. American Physical Society. 56 (5): 426–450. Bibcode:1939PhRv...56..426B. doi:10.1103/PhysRev.56.426. ↑ Wheeler & Ford 1998, pp. 27–28. ↑ Bohr, Niels; Wheeler, John Archibald (November 1939). "The Fission of Protactinium". Physical Review. American Physical Society. 56 (10): 1065–1066. Bibcode:1939PhRv...56.1065B. doi:10.1103/PhysRev.56.1065.2. ↑ Bohr, Niels; Wheeler, John Archibald (January 1940). "Resumés of Recent Research". Journal of Applied Physics. 11 (1): 70–71. Bibcode:1940JAP....11...70.. doi:10.1063/1.1712708. ISSN 0021-8979. 1 2 Wheeler & Ford 1998, p. 31. ↑ Wheeler & Ford 1998, pp. 117–118. ↑ Wheeler & Ford 1998, p. 39. 1 2 Ford, Kenneth W. (February 14, 1994). "Interview with Dr. John Wheeler – Session VII". American Institute of Physics. Archived from the original on February 1, 2013. ↑ Christy, R. F.; Wheeler, J. A. (January 1, 1943). "Chain Reaction of Pure Fissionable Materials in Solution". Metallurgical Laboratory. ↑ Wheeler & Ford 1998, p. 40. ↑ Weinberg 1994, p. 14. ↑ Weinberg 1994, pp. 27–30. ↑ Jones 1985, p. 203. 1 2 Wheeler & Ford 1998, pp. 46–48. ↑ Jones 1985, pp. 210–211. ↑ Rhodes 1986, pp. 558–60. ↑ Wheeler & Ford 1998, p. 56. 1 2 Wheeler & Ford 1998, p. 61. ↑ Gefter, Amanda (January 16, 2014). "Haunted by His Brother, He Revolutionized Physics". Nautilus (9). ↑ Wheeler & Ford 1998, p. 75. ↑ Wheeler & Ford 1998, pp. 161–162. ↑ Wheeler & Ford 1998, pp. 171–177. ↑ Wheeler, John (March 1947). "Mechanism of Capture of Slow Mesons". Physical Review. American Physical Society. 71 (5): 320–321. Bibcode:1947PhRv...71..320W. doi:10.1103/PhysRev.71.320. ↑ Tiomno; Wheeler, J. A. (January 1949). "Charge-Exchange Reaction of the μ-Meson with the Nucleus". Reviews of Modern Physics. American Physical Society. 21 (1): 153–165. Bibcode:1949RvMP...21..153T. doi:10.1103/RevModPhys.21.153. ↑ Tiomno, J.; Wheeler, J. A. (January 1949). "Energy Spectrum of Electrons from Meson Decay". Reviews of Modern Physics. 21 (1): 144–152. Bibcode:1949RvMP...21..144T. doi:10.1103/RevModPhys.21.144. ↑ Wheeler, John (November 1953). "Mu Meson as Nuclear Probe Particle". Physical Review. American Physical Society. 92 (3): 812–816. Bibcode:1953PhRv...92..812W. doi:10.1103/PhysRev.92.812. ↑ Wheeler & Ford 1998, pp. 177–179. ↑ "John A. Wheeler". John Simon Guggenheim Memorial Foundation. Retrieved December 6, 2014. ↑ Wheeler & Ford 1998, p. 183. 1 2 Wheeler & Ford 1998, pp. 188–189. ↑ Rhodes 1995, pp. 416–417. ↑ Wheeler & Ford 1998, p. 202. ↑ Wheeler & Ford 1998, pp. 193–194. ↑ Wheeler & Ford 1998, p. 196. ↑ Rhodes 1995, pp. 457–464. 1 2 3 Wheeler & Ford 1998, pp. 218–220. ↑ Wheeler & Ford 1998, pp. 285–286. ↑ Ford, Kenneth W. (April 2009). "John Wheeler's work on particles, nuclei, and weapons". Physics Today. 62 (4): 29–33. Bibcode:2009PhT....62d..29F. doi:10.1063/1.3120893. ↑ Wheeler & Ford 1998, pp. 224–225. ↑ Wheeler & Ford 1998, pp. 121–122. ↑ Wheeler & Ford 1998, pp. 144–145. 1 2 "Obituaries". www.towntopics.com. Retrieved 2016-01-08. ↑ "Princeton University – Leading physicist John Wheeler dies at age 96". www.princeton.edu. Retrieved 2016-01-08. ↑ Carlson, Michael. "Obituary: John Wheeler". the Guardian. Retrieved 2016-01-08. 1 2 Wheeler, J. A. (January 1955). "Geons". Physical Review. 97 (2): 511–536. Bibcode:1955PhRv...97..511W. doi:10.1103/PhysRev.97.511. ↑ Wheeler & Ford 1998, p. 237. ↑ Wheeler & Ford 1998, pp. 239–241. ↑ Misner, Charles W.; Wheeler, John A. (December 1957). "Classical Physics as Geometry". Annals of Physics. 2 (6): 525–603. Bibcode:1957AnPhy...2..604W. doi:10.1016/0003-4916(57)90050-7. ISSN 0003-4916. ↑ J. Wheeler (1961). "Geometrodynamics and the Problem of Motion". Reviews of Modern Physics. 44 (1): 63–78. Bibcode:1961RvMP...33...63W. doi:10.1103/RevModPhys.33.63. ↑ J. Wheeler (1957). "On the nature of quantum geometrodynamics". Ann. Phys. 2 (6): 604–614. Bibcode:1957AnPhy...2..604W. doi:10.1016/0003-4916(57)90050-7. ↑ Wheeler & Ford 1998, p. 248. ↑ Hawking et al. 2003, pp. 80–88. ↑ Wheeler & Ford 1998, p. 296. ↑ DeWitt, B. S. (1967). "Quantum Theory of Gravity. I. The Canonical Theory". Phys. Rev. 160 (5): 1113–1148. Bibcode:1967PhRv..160.1113D. doi:10.1103/PhysRev.160.1113. ↑ Hartle, J.; Hawking, S. (December 1983). "Wave function of the Universe". Physical Review D. American Physical Society. 28 (12): 2960–2975. Bibcode:1983PhRvD..28.2960H. doi:10.1103/PhysRevD.28.2960. ↑ Wyler, John Archibald (1974). "Rasputin, Science, and the Transmogrification of Destiny" (PDF). General Relativity and Gravitation. 5 (2): 175–182. Bibcode:1974GReGr...5..175W. doi:10.1007/BF00763499. ↑ Misner 2010, p. 22. ↑ Wheeler & Ford 1998, pp. 232–234. 1 2 3 "Report of the Memorial Resolution Committee for John A. Wheeler" (PDF). Retrieved December 6, 2014. ↑ Misner, Charles W.; Thorne, Kip S.; Zurek, Wojciech H. (April 2009). "John Wheeler, relativity, and quantum information". Physics Today. 62 (4): 40–46. Bibcode:2009PhT....62d..40M. doi:10.1063/1.3120895. ↑ Wheeler & Ford 1998, pp. 334–339. ↑ Gribbin, Gribbin & Gribbin 2000, pp. 270-271. ↑ Saunders 2010, p. 6. ↑ Christensen, Terry M. (April 2009). "John Wheeler's Mentorship: An Eenduring Legacy". Physics Today. 62 (4): 55–59. Bibcode:2009PhT....62d..55C. doi:10.1063/1.3120897. ↑ Gardner & 1981, pp. 185ff. 1 2 Wheeler & Ford 1998, pp. 342–343. ↑ Wheeler, J. A. (1979). "Parapsychology – A correction". Science. 205 (4402): 144. doi:10.1126/science.205.4402.144-b. ↑ Wheeler 1990, p. 5. ↑ Ford 2006, p. 2. ↑ "The anthropic universe". Science Show. 18 February 2006. ↑ Wheeler 1987, p. iii. ↑ Overbye, Dennis (April 14, 2008). "John A. Wheeler, Physicist Who Coined the Term 'Black Hole', Is Dead at 96.". The New York Times. Retrieved April 15, 2008. John A. Wheeler, a visionary physicist and teacher who helped invent the theory of nuclear fission, gave black holes their name and argued about the nature of reality with Albert Einstein and Niels Bohr, died Sunday morning at his home in Hightstown, N.J. He was 96. Ford, Kenneth (Winter 2006). "Update on John Archibald Wheeler" (PDF). Princeton Physics News. 2 (1). Misner, Charles W. (2010). "John Wheeler and the Reccertification of General Relativity as True Physics". In Ciufolini and, Ignazio; Matzner, Richard A. 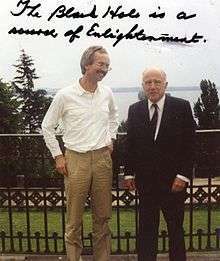 General Relativity and John Archibald Wheeler. New York: Springer. doi:10.1007/978-90-481-3735-0_2. ISBN 9789048137350. Wheeler, John A. (1990). "Information, physics, quantum: The search for links". In Zurek, Wojciech Hubert. Complexity, Entropy, and the Physics of Information. Redwood City, California: Addison-Wesley. ISBN 978-0-201-51509-1. OCLC 21482771.